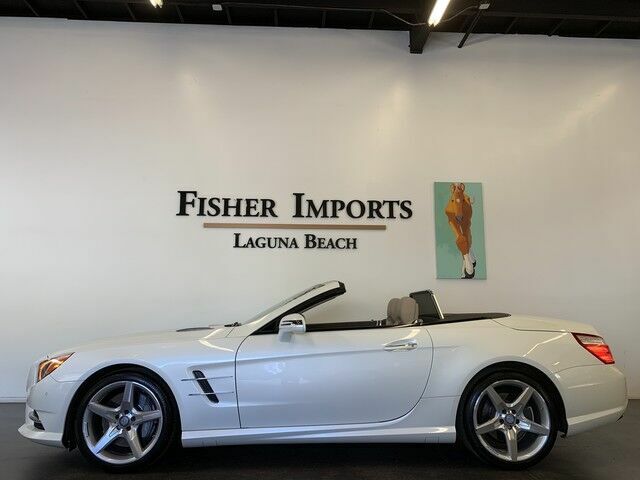 YOU ARE VIEWING A PRISTINE 2013 MERCEDES-BENZ SL550!!! DIAMOND WHITE OVER BEIGE/COCOA!!! ONLY 25,718 MILES!!! THIS CAR COMES WITH 2 KEYS, ORIGINAL OWNERS MANUAL KIT, WHEEL LOCKS, TOOLS. HIGHLY OPTIONED!!! PREMIUM PKG. KEYLESS GO!!! NAVIGATION. BLUETOOTH. FRONT & REAR PARKING SENSORS. BACKUP CAMERA. HEATED & COOLED SEATS. AIR SCARF. PANORAMA ROOF!!! Please call Fisher Imports Laguna Beach at 949-715-8988. We are happy to assist with the arrangement of pre-purchase inspections & transport. Financing & Lease options available.